Car parking is available to the rear of the house. The car park surface is tarmac. Entrance to the B&B is a short walk from the rear of the house to the front along an unevenly surfaced shared access road. To get to the front door there is a gate followed by 8 steps with a handrail to the left ascending. Alternatively, there is an inclined driveway in front of the garage which can also give access to the front door by passing in front of the bay window. This alternative route has 3 steps. There are 3 first floor bedrooms and no ground floor guest accommodation. There are 13 steps up a fairly steep flight of stairs to get to the first floor. The stairs have a handrail on the right-hand side ascending. Bedroom 1 is a double room with en-suite bathroom. The bedroom has touch sensitive lamps at the bedside and there is a range of storage at various heights available. There is a remote controlled TV with Freeview channels and DVD player built in. The bathroom has a shower only. The sink and shower have lever taps and there is good colour contrast between the walls and bathroom suite. The shower head is adjustable. There is no shower seat. Bedroom 2 is a twin room with en-suite bathroom. The bedroom has lighting at the bedside and there is a range of storage at various heights. There is a remote controlled TV with Freeview channels and DVD player built in. The bathroom has a shower only with height adjustable showerhead. The shower has a lever tap and there is good colour contrast between the walls and bathroom suite. There is no shower seat. Bedroom 3 is a family room. It consists of two adjoining rooms with twin beds in each room. To get from one room to the other there are 3 steps through the adjoining doorway. The room at the bottom of the steps is an attic conversion with a slanting ceiling and Velux window. One of the rooms has a sink with lever taps. There is a remote controlled TV with Freeview channels and DVD player in each room. The private bathroom is situated across the landing. This room has a bath with an over-bath shower. The sink and bath have lever taps and there is good colour contrast between walls and bathroom suite. There is no shower seat. The lounge with 2 settees and coffee table is located on the ground floor. There is also a TV and video. The breakfast room is located on the ground floor next to the lounge. The room is well lit and has ample room for manoeuvrability. Dietary requirements can be catered for, with advance notice to be discussed on booking before arrival. Each room has adjustable heating controls on all radiators. Hot water bottles are available for use in all rooms. Oakfield B&B has an audible fire alarm system only. If specific requirements are needed in the case of an emergency, please discuss before booking. Most mobile phone networks are available in this area. 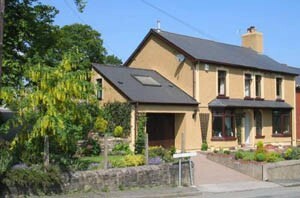 Information supplied by Oakfield B&B can be produced in large print, in most cases. Please ask if required. Assistance dogs are welcome at Oakfield B&B. Oakfield B&B operates a no smoking policy. We would like to advise our guests that we are committed to the issue of disability access and aim to provide a quality service wherever possible. We will continue to assess and impove disability access whenever possible. If you require further information please call us on +44 (0)1495 792 829.